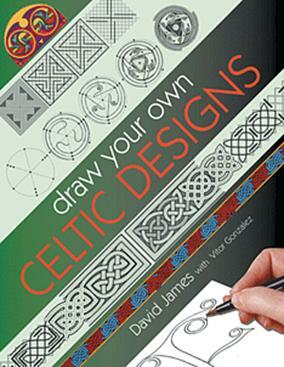 An indispensable step-by-step guide to drawing a wide variety of Celtic designs - for artists and crafters working in all media. Starting with an illustrated introduction to the Celts and the development of Celtic design the author places the book's designs into their historical context. The following chapters examine each of the main Celtic patterns in turn: knots spirals key patterns animals and beasts and Celtic lettering. Each chapter opens with a large colour illustration to inspire readers in ways of incorporating the design into their own work. This is followed by a short introduction to the range of patterns that fall into this design category along with photos of Celtic artefacts. The rest of the chapter consists of 16 design pages each containing a specially commissioned step-by-step artwork for readers to follow. Beautiful to look at and exquisitely executed in themselves each artwork has been carefully constructed so that readers can follow its build up from start to finish with no possibility of error. The chapter on Celtic lettering contains a specially commissioned double-page artwork of the Celtic alphabet for readers to copy and is followed by instructions on how to embellish each of the letter forms in Celtic styles.